This piece originally appeared on InStyle.com. 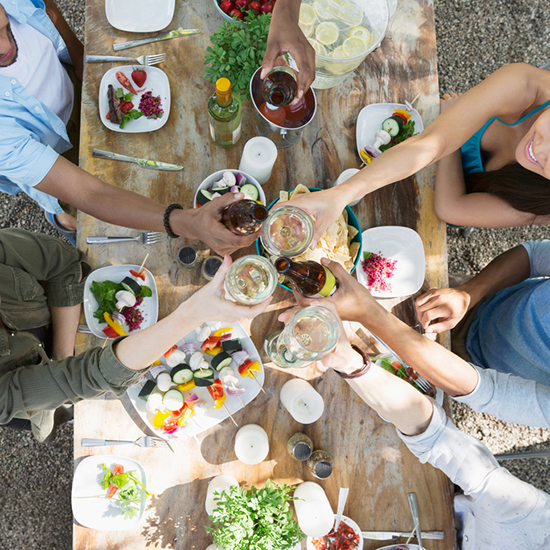 Throwing a backyard party can be all fun and games—that is, until a swarm of blood-thirsty mosquitoes start dining on your guests. If you plan on entertaining outdoors this summer, fear not. We went on bug patrol and came up with a list of easy ways to keep pesky mosquitoes from ruining your good time. These chic candles are tougher than they look. They contain essential oils to naturally defend against mosquitoes, while delivering an alluring aroma your guests will be sure to compliment ($110 for a set of 3; aromaflage.com). While mosquito dunks don’t actually repel mosquitoes, they can prevent them from invading your backyard to begin with. Place them in standing water like birdbaths and gutters (aka the insect’s favorite hangouts) to kill larvae for at least 30 days ($11 for 6; walmart.com). The battery-operated fan emits mosquito repellant, providing up to 12 hours of protection. It’ll even keep you cool on those sticky summer nights ($8; walmart.com). Badger’s all-natural balm protects skin from annoying pests, thanks to its blend of organic citronella, cedar, and lemon grass essential oils. It’s completely free of DEET and other toxic ingredients, making it safe for the little ones to use ($9; drugstore.com). What’s a summer party without a tiki torch? When paired with citronella fuel, this one deters mosquitoes while also setting a festive mood ($20; bedbathandbeyond.com). No outdoor bash would be complete without a trusty bug spray. We like Burt’s Bee herbal version, which boasts rosemary, lemongrass and citronella oils and a light, refreshing scent ($8 for a pack of 3; amazon.com). Perfect for any outdoor gathering, this candle and diffuser combo will keep your party mosquito-free for up to six hours. Simply light the candle to release the repellant from the diffuser ($14; truevalueus.com). Offer your guest bug wipes to ward off airborne attackers (trust us, they’ll appreciate it). These are gentle on the skin and don’t include any stinky chemicals ($3; walmart.com).